When responding to critics, marine parks like SeaWorld call their opponents "radical activists," as if to imply protesting orca captivity is outside the mainstream. Beyond unfair, it's an ironic accusation. Why? Because the guy who pioneered keeping killer whales in captivity for personal enjoyment was a crazy person simply hell-bent on riding an orca. As much as park operators like to position their arguments as if they were a long-accepted institution being forced to weather the gripes of cuckoo animal-rights wackos, keeping large, intelligent marine mammals confined to tiny pools is a relatively modern concept. And, from the very start, there were plenty of people who had a problem with it. In the early 1960s, oceanariums had begun to sprout up throughout the U.S., but most bore a closer resemblance to educational aquariums than the amusement attractions they are today. Twice, park operators had attempted to add an elusive killer whale to their exhibits, but on both occasions the animals died shortly after being put into captivity. Many thought that those animals were just too dangerous and strong-willed to be tamed, and the idea of capturing them was abandoned. That all changed when a 29-year-old entrepreneur named Ted Griffin, owner of the rinky-dink Seattle Marine Aquarium on Pier 56, became obsessed with fulfilling a lifelong fantasy -- not to kindheartedly commune with majestic marine mammals, but rather to ride one like a goddamn horse. "[When I was a small child in one] book there was a picture of a boy riding a dolphin. It was sort of a surrealistic kind of image. But it struck me and I kind of carried that in my mind," Griffin said in an interview with PBS's Frontline. " And it started to grow on me and I actually believed... that's what I was going to do, and I could see myself riding a dolphin, if you will." But soon Griffin's crazy dolphin-riding ambitions evolved into one even a bit more symptomatic of an unstable mind: riding those bigger animals, the one's with ‘killer' in their name. He even began to stalk them. 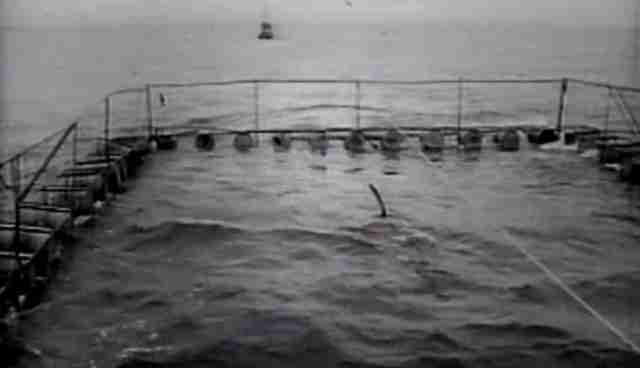 "As the years went by I became fascinated with the whales that were in Puget Sound but of course they're extremely dangerous. ... I lived on the water and we started following the whales in the boat and then...," said Griffin. "[I]n that period of time... I decided I would attempt to ride one of these whales, later learning that the whale was actually a dolphin but a very big one, with teeth of course". 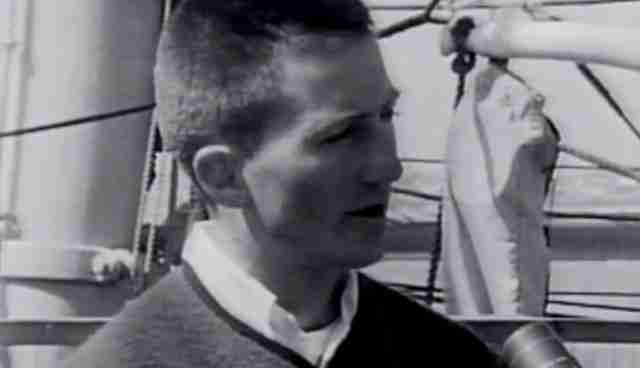 For years, Griffin patrolled Puget Sound by boat, and occasionally even a helicopter, in search of a whale to ride. He knocked on doors of houses along the water to ask if people if they'd seen any, and even tried to get the Coast Guard to help him track one down. To be clear, this was more than quest for a new attraction at his aquarium. It was to force the animal to be his friend. "The idea was simple enough," Griffin recalled. "I would have the whale as a personal companion but I'd have to charge admission to see him so I could feed him because as it worked out, he ate about 400 pounds of salmon every day." But the whales weren't cooperating with his plan. So consumed with this fantasy, Griffin neglected his business and was driven into bankruptcy. Then, in 1965, he had a stroke of luck. Griffin heard that some fishermen up north in Namu, British Columbia had accidently snared a 22-foot-long killer whale, and were willing to sell it for $8,000. The crafty aquarium operator tapped his friends for some cash and giddily caught a plane to Namu to claim the unfortunate creature which he had fixated on for so long. "I went up and viewed the whale and really fell in love...," he said. Getting the orca, named Namu, back to Seattle was no easy task, but Griffin was able to raise enough money to have a floating pen built so that it could be towed back by boat. The press had a field day with the spectacle of moving the animal to its place at the aquarium, of course, and Griffin became something of a celebrity. But all that mattered little compared to the fact that he could finally sit and ride a killer whale. 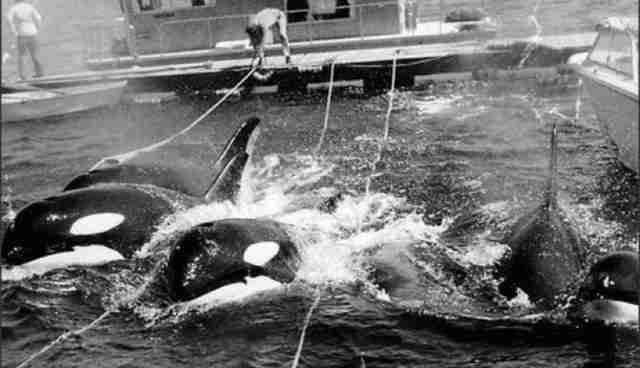 At the time, not everyone was so enthusiastic about seeing Griffin's dream fulfilled -- especially when they learned that he planned on capturing more orcas, including a female companion for Namu, named Shamu. "People [quickly] began to become concerned about the welfare of the whale and it wasn't very long before I was being challenged as to [why I would catch more whales when I already had one]," says Griffin. "And I explained that... I enjoyed the capture of the whales and... [that] they were all unique and different ... [T]here were a number of oceanariums that were willing to pay me a very reasonable price. 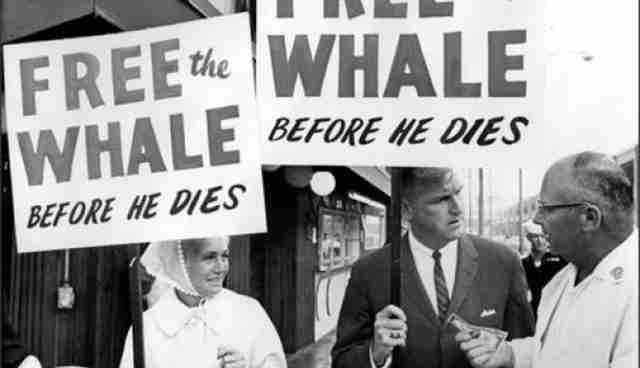 "But what we did was we would catch a few whales and suddenly I could see that the trend was so remarkable and that the people were so... against [keeping] whales in captivity that I realized it would be extremely difficult to continue that enterprise." However, demand for whales turned into a booming new business. What started out as just one killer whale in captivity, a novelty, rapidly grew as Griffin and his partners began capturing them by the dozen. 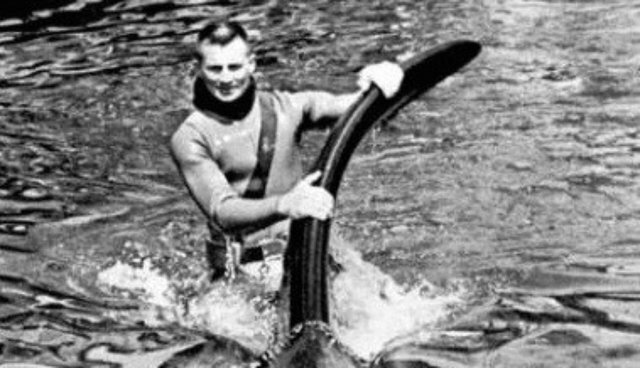 Soon, he became the go-to supplier of orcas for marine parks across the United States -- seeding a legacy, controversial from its inception, that continues well into today. "Sea World had come to Seattle and was very interested in acquiring a killer whale for their new facility in San Diego, and for awhile we negotiated and then finally I [agreed]," he said.
" ...[T]hey wanted to call the whale Namu and they wanted the rights to the name, and I wouldn't do that. So they said okay, we'll... call her Shamu, and that's how it all started. So Shamu went to San Diego and Namu stayed in Seattle." Griffin's first love, Namu, died after about a year in captivity. Although he was devastated by the loss, he continued to sell orcas like this well into the 1970s. When he finally did retire, others swept in to fill his place. Nearly all the captive orcas currently in the United States are descended from those early captives. Griffin has since fallen out of the public spotlight and is said to have gone on to start a technology firm in Seattle. But in a 1995 interview, he speaks wistfully about the industry he was instrumental in pioneering -- echoing, in part at least, the sentiments of people marine park operators would call ‘radicals'. In fact, Griffin seems to admit that the real radical was himself as a younger man, driven to try to capture these animals in the first place. "Just because we're man and we have charge of things, or we think we have charge of things, doesn't automatically mean that we have the rights to superimpose our will on everybody," says Griffin. "People ask me about animals in captivity. Is it right? Well -- for a time in our lives -- this is what is done and I maintained Namu in captivity. That doesn't mean that I didn't want to have him wild, it's just that I couldn't overcome the urge to have him under my control." Nearly 40 years after Griffin captured Namu, there are now more than 50 killer whales held confined in marine parks throughout the world -- and in that time, the calls to end their captivity have only gotten louder.